CSU's Council on Ocean Affairs, Science & Technology (COAST) has recently awarded Dr. Aiello with a 'rapid response' grant to study changes in beach morphology and sand budgets in Monterey Bay during the storm activity associated with the 2015 EL Niño. 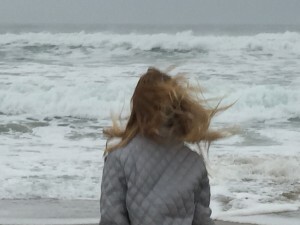 In Monterey Bay, as well as along the whole west coast of the US, large storm events are the primary controlling factor over beach dynamics, and high-energy conditions are particularly intense during El Niño years. Large storms associated with EL Niño have dramatic effects on the coastal environments: they increase the sediment yield from rivers and accelerate the erosion of seacliffs and coastal dunes. Storm activity also produces along-shore currents that can move large volumes of sand parallel to the coastline (littoral transport, often referred to as a 'river of sand'). If along its way, the 'river of sand' is intercepted by obstacles like the head of a submarine canyon or a promontory, the sand can be deflected offshore and permanently transferred from the coastal environment to the deep seafloor where it is lost forever. This loss might affect the resilience of beach sediments which act as a primary coastal buffer to prevent or delay seacliff and beach erosion, some of the most compelling problems affecting California’s coastal environments. Geologists call a portion of coastline that includes a source for sand (for instance a river's mouth), and a sink (for instance the head of a submarine canyon) a littoral cell. The main sink for sand in the Monterey Bay is the head of the Monterey Canyon (C) which dissects the continental shelf and comes very close to shore right in front of Moss Landing Marine Lab. 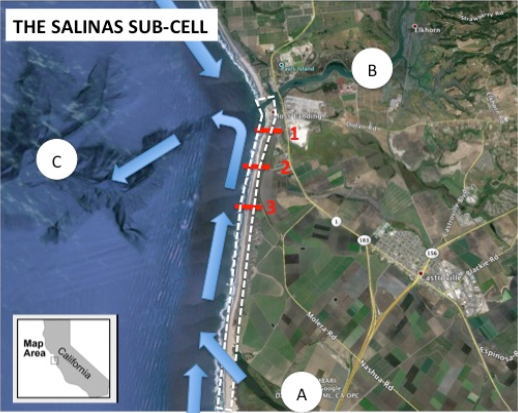 The segment of the beach between the mouth of the Salinas River (A), and Elkhorn Slough (B) is a small littoral cell (or sub-cell) which we call the Salinas sub-cell. There are many littoral cells like the Salinas sub-cell along the California coastline: during 'normal' winter storm conditions the sand moves alongshore relatively slowly and not much sediment is lost from the littoral system. However, during El Niño condition sand circulation in the littoral cells occurs much faster. Not only is the 'river of sand' carrying larger volumes of sand but it can also flow in directions different from normal winter conditions because the swell, which typically comes from the northwest, is now coming from the west and the southwest. Future predictions of raising sea level conditions combined with more frequent and larger storms and El Niño events require a better, more quantitative approach to understand sediment dynamics in littoral cells in relation to oceanography. Understanding sediment budgets in littoral cells during high-energy events and storm-dominated seasons provides essential planning tools for regional and coastal management. To monitor changes in sand volume along the beaches of the Salinas sub-cell Dr. Aiello's Lab is using some of the most advanced mapping tools available in coastal geomorphologic studies. In early Fall 2015, before the beginning of the storm activity associated with the 2016 El Niño, we were able to coordinate a demonstration survey of the sub-cell's coastline using an unmanned autonomous vehicle (UAV) equipped with a very-high-resolution camera. Based on ground controls these images can be post-processed to produce high-resolution digital elevation models (DEMs) of the terrain as shown in the digital rendering of the Moss Landing Marine Lab building and surrounding property. Our strategy is to combine the DEM baseline with 'ad hoc' high-resolution surveys of specific sections of the beach (the red, numbered lines in the first figure) before and after major storm events using a field-based survey equipment called a Terrestrial Laser Scanner or TLS. 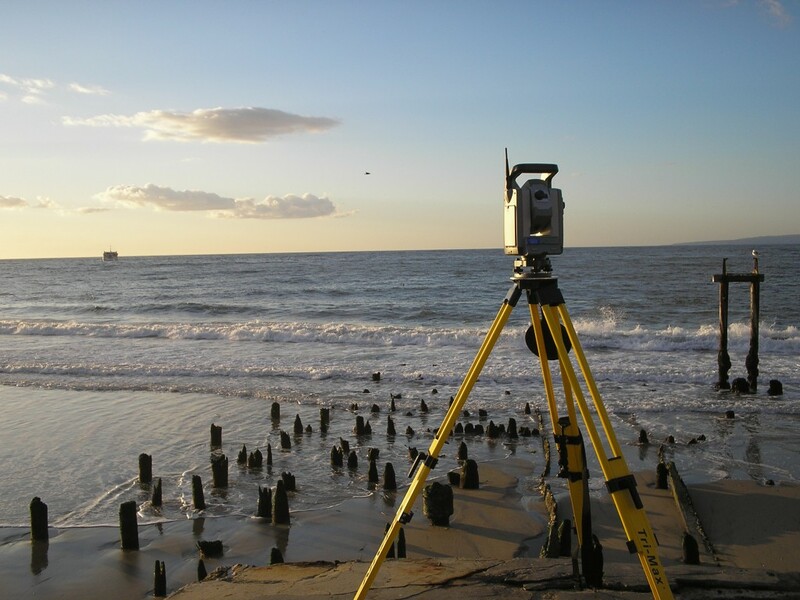 The TLS is a powerful, portable instrument for surveying rapidly and very accurately beaches, dunes, and many other coastal habitats including estuaries and the rocky intertidal. At the end of this study we hope to gain a better, more quantitative understanding of the fate of beach sediments during El Niño conditions in Monterey Bay. What we can learn in the Monterey Bay can be also translated to other littoral cells in California and can be used to improve our ability to predict and possibly mitigate the effects of future climate and sea level changes. If you have any questions feel free to contact Dr. Aiello.